I distinctly remember the moment I fell in love with goat cheese. It was 2003. I was at a winery in Williamsburg, VA with two very dear friends of mine. Until that moment, I had always proclaimed my dislike for the stuff. Then, I tasted this amazing white, creamy, tangy, deliciousness atop a piece of crusty French bread. THIS was goat cheese? No way. I had tried it once before, but this was not the taste I remembered. From that day until now, I am constantly proclaiming my love for this ingredient and finding new ways to use it in recipes. Goat cheese comes in many forms—all of which are amazingly complex and tasty. Some cheese makers specialize only in goat cheese offering several types or flavors, while others make cheese with sheep and cow’s milk, too. I have a few favorite cheese makers in our area, but the one that I visit most often is Hillsborough Cheese Company at the Western Wake Farmers Market. Dorian West and his wife, Cindy, produce some incredible cheeses. I especially love their plain goat Chèvre (used in the recipe below) and their Lebna (a yogurt cheese used in Middle Eastern cuisine). I have used the Lebna in a previous post here. Suffice it to say, I am huge fan of all of their cheeses and buy some nearly every week. Slice the cleaned spring onions in half lengthwise and then chop into 1/8” half-moon slices. Season with salt and pepper. Reduce heat to low and add the goat cheese. Stir to combine ingredients and remove from heat. 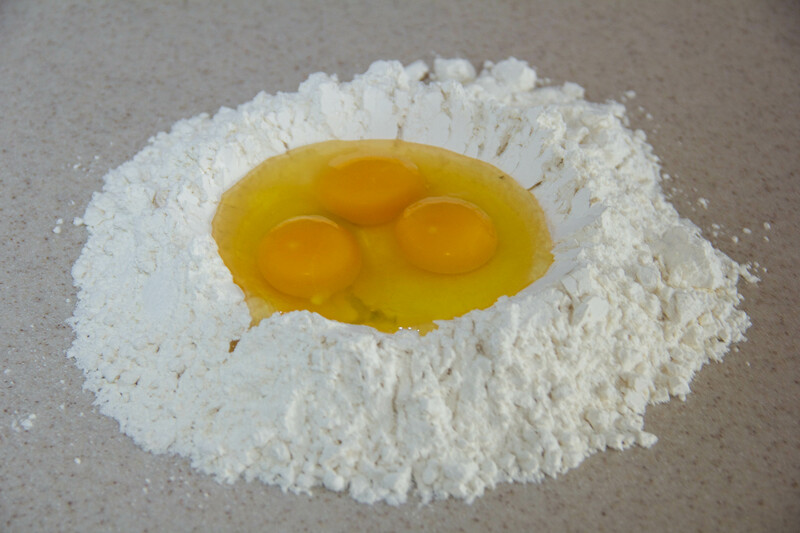 Allow mixture to cool before making ravioli. **The original recipe for this goat cheese filling was from a class I took at Durham Spirits Company. Chef Katie Coleman used this spread atop a crostini and drizzled it with red pepper jelly. PLEASE try that, too. This recipe is very versatile. Cut the dough into two 12” lengths. Place one sheet on the ravioli tray and use the plastic insert to make wells for the filing. Place 1 tsp. of filling in each well. Place the second sheet over the first one, making sure that the edges are covered. Seal and cut ravioli by rolling a rolling pin over the tray. Ensure that all of the edges are sealed and there are no air pockets around the filling. 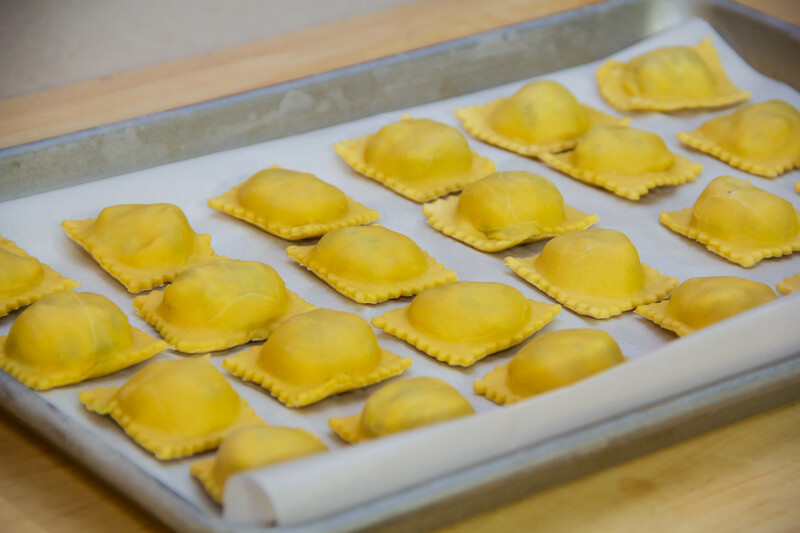 Place the ravioli on a lightly floured baking sheet to dry for at least 10 minutes. Fill a stockpot with water. Bring to a boil and add 1 tsp. salt. Add ravioli and stir gently to prevent sticking. Return water to a boil and reduce heat to a gently boil. Cook ravioli for about 4 minutes gently stirring occasionally to ensure even cooking. 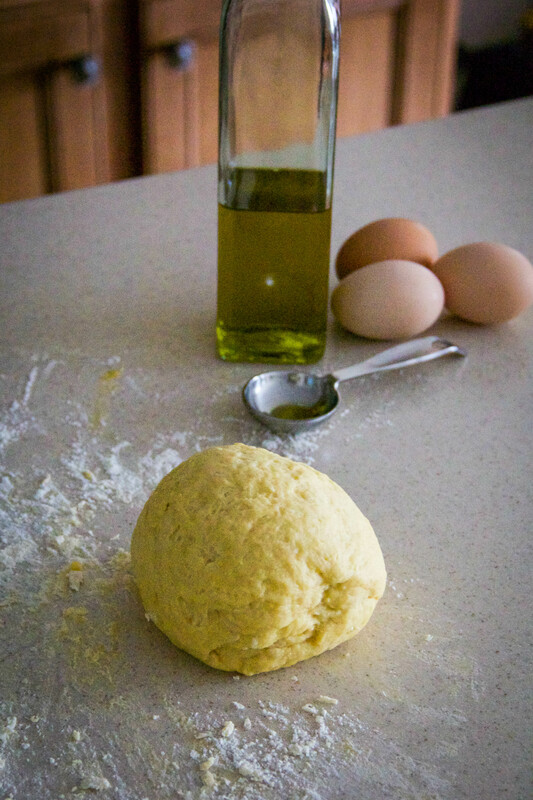 While the ravioli is cooking, melt butter and olive oil in a skillet or sauté pan. Add the garlic and red pepper. Reduce the heat to low and slowly toast the garlic while the ravioli continues to cook. Using a slotted spoon, remove the ravioli from the pot and add to the skillet. Toss to coat and serve. This is how I prep the ravioli for freezing. Once they are completely frozen, place in a freezer bag. When cooking from frozen, increase time by 2 minutes. I have enjoyed every bite of sun-ripened tomato, juicy peach, sweet buttery corn, and spicy pepper from the summer harvest. I will miss these delicacies in a few short weeks. The stockpile of frozen summer produce that fills my freezer won’t last long—it never does. It’s okay, though. Fall brings special treats, too. The first sign that fall is approaching? Apples! They are such a versatile fruit. I add apples to butternut squash soup for sweetness and acidity. They pair perfectly with pork, so I use them when roasting a pork loin or braising a pork belly. And, of course…apples are perfect for dessert. Apple pie, apple crisp, apples and caramel, apple gallette, and apple dumplings are just a few of my favorites. Apples are the final fruits of the year here in North Carolina. They are celebrated in the mountains and savored for as long as possible. It will be quite a while before we’ll see any fruit at our farmers markets once they are gone. Recently, I visited Six Forks Cheese in Raleigh. If you like cheese, and you haven’t been there yet, please make plans to go. You can thank me later. It is a cheese-lover’s paradise. They generously let me taste any cheese I was curious about. 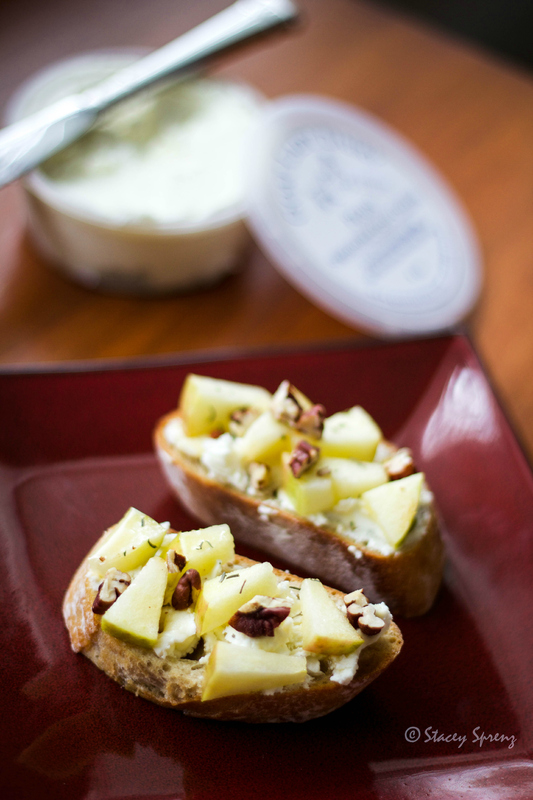 I bought some amazingly mild blue cheese from Denmark that was the perfect pairing for the North Carolina Honey Crisp apples I had purchased the day prior. This afternoon snack had me dreaming of other apple and cheese combinations. My favorite go-to cheese is chèvre. 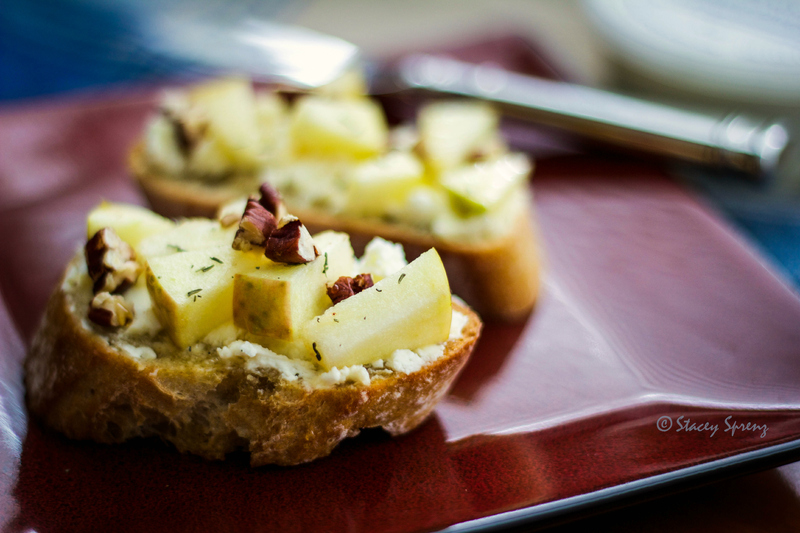 Apples and goat cheese…perfect snack or—wait, what about an appetizer? A crostini is simple and will let the flavors shine. Let’s do this! First, I toasted baguette slices by brushing them with olive oil and letting them get golden in a 350 degree F oven. Once they were cooled, I spread each one with Goat Lady Dairy chèvre. Let the chèvre sit out of the refrigerator for about 30 minutes to soften it and make it more spreadable. I diced up a North Carolina grown Honey Crisp apple and placed it atop the cheese. A little drizzle of local honey, some chopped toasted North Carolina pecans, and a sprinkling of dried thyme completed my masterpiece. Well, okay—maybe not a masterpiece, but it was delicious.